Today the sharing, or collaborative, economy in which ordinary citizens swap products and co-create ideas and services, enjoys widespread attention. This enthusiasm not only comes from the citizens themselves, but also from businesses and governments. From these circles springs a dazzling stream of traditional policy reports and advice papers seeking to get a grip (quite literally) on the activities in the collaborative economy. As firms and governments have great influence on economic life, the angle they take on the sharing economy determines its future direction. That turns out to be ill-fated: the old economy is mapped onto, and smothers, the true potential of the collaborative economy. By discussing two examples from the European policy context, I will explain why collaborative economy is misinterpreted on many levels. Let’s start with ‘An economic review of the collaborative economy’, a policy brief by the influential Brussels-based think tank Bruegel. In the text, three aspects stand out. 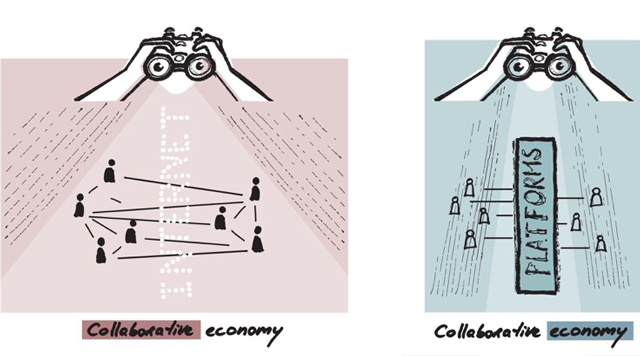 First, the basic viewpoint of the Bruegel report is that collaborative economy initiatives fulfil market functions. Collaborative platforms, we read, ‘broker supply and demand’ and ‘increase economic efficiency’. The fast-growing collaborative platforms help meet ‘consumer preferences’ and ‘increase competition’. This free-market language is all over the report, while social ideas and incentives are hardly touched upon. Secondly, Bruegel’s discussion of collaborative initiatives is heavily tilted towards the big corporate players. When demonstrating that Europe is ‘far behind’ on the collaborative economy compared to other continents, for example, Bruegel cites a number of a meagre 27 platforms – but with a combined worth of nearly two hundred billion dollars and boasting over 100,000 employees! Given the average value of $ 7 billion per platform, this must be the collaborative economy’s ‘1 percent’: the handful of top players owning nearly the whole ‘collaborative’ market. The other 99 percent are not in their view. Thirdly, the report recurrently refers to the collaborative platforms as ‘intermediaries’. That is striking, because one of the intended merits of the sharing and collaboration movement was that of taking out the middle man (‘disintermediation’, in jargon). Of course, we know that the new mega-platforms are quite happy with their central, intermediate position. But it’s surprising how much they find allies in economic policy circles. In fact, I wonder what’s collaborative about all of this. Bruegel’s collaborative economy amounts to a highly capitalist industry, a far cry from the “happy sharing, friends making” narrative so often heard in sharing economy circles. What we see here is a plain case of what Tomáš Sedláček calls ‘subject-object reversal’ in economics. We start with a genuine, heartfelt aim: an economy with ‘a sense of community, collective accountability and mutual benefit’ (I’m still citing the Bruegel paper here, actually). To get there, large digital platforms could be instrumental. However, the former is a messy target from a regulatory perspective, while the platforms are quite solid and good to analyse and administer. So, next moment we find the platforms have become the collaborative economy. The corporations are what economists and policy makers bend their minds on and what are encouraged to thrive. Consequentially, the collaborative economy’s bigger social potential for economic life – the deep value brought to citizens and communities – is neglected and wasted. The second document, the European Commission’s agenda for the Collaborative Economy, suffers from similar shortcomings. The Commission formally puts the attention where it ought to be: on the public interest, a.k.a the common good. The document maintains the official policy mantra that regulation should not impose more restrictions than is necessary to safeguard the public interest. That sounds beautiful, but results in a rather defensive strategy. When a new player, technology or disruptor enters the scene, regulators wait and see. Early ‘weak’ signals of dissatisfied citizens do not warrant a defence of the public interest. Only when negative impacts grow to unambiguous heights and the poo hits the fan, regulators spring to life. But having arrived at that point, their scope stops at rearguard action: patching up, limiting the harm done, frolicking for ‘case-by-case’ solutions. As a result, the public good is always one (big) step behind. Collaborative economy policies have been staring too much at what’s coming out of the glass towers, and in the process forgot about the larger social sphere, where the magic actually happens. What you give attention to, will grow. So let’s focus on the adjective in ‘collaborative economy’, instead of the noun. We have done enough of helping big companies make more profits. Now it’s time to shift gears. Invest in digital social innovation: the bottom-up generation of connective ideas and practices that generate sustainable value for all, instead of eroding the basis and enriching the few. Let’s shake off the public’s cheerless self-image of being just the total number of residents in any corporation’s blast range. Today, ‘public’ is a rest category, an incoherent policy checklist. All too often the public interest is interpreted as merely consumers’ interest. But it’s the bread and butter of society, and a moving target at that. We should constantly make effort to redefine the public interest and let it determine, instead of receiving the blows of, technological developments. I therefore suggest the Commission, next to the ‘Digital Single Market’, launch the ‘Digital Single Public’: a forum and agenda to reinvent social values in the digitizing world. This Public will be ‘single’ in its connectedness and sympathy to the European spirit; but diverse and dynamic in its people, solutions and ideas. At Waag Society, my current professional ‘residence’, we are constantly looking for tools and interventions to widen the view on the collaborative economy, like our friends from FairBnB, who want to bring the community into the local tourism platforms, and keep the value there. I hope you will join our mission to make the European public ‘great again’.